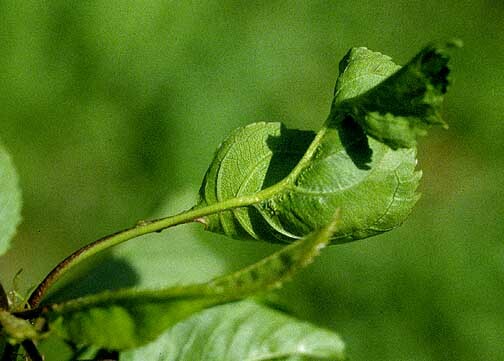 Note how the leaf midrib is curved, causing the leaf to have a twisted apearence. Cause Cherry twisted leaf-associated virus. has been reported from Washington, Idaho, and British Columbia and found in the Willamette Valley and The Dalles, Oregon. The disease is not common and occurs irregularly in the Pacific Northwest. It is easily transmitted by budding, grafting, or chip budding. The disease spreads in the orchard but there are no known vectors. 'Bing' and 'Rainer' are susceptible as is western chokecherry. Apricot Ring Pox disease is caused by the same virus. Symptoms The most consistent symptom is an abrupt kink in the midrib or the petiole, which causes the leaf to appear twisted. Leaves frequently develop asymmetrically or stay small. Spurs appear bunchy due to shortened internodes. Once the tree is infected, the disease spreads rapidly to all branches. Symptoms occur each year on infected trees, but their severity is variable: generally, more severe in older trees of medium vigor. Plant trees certified as virus-tested (and found to be free of all known viruses). Reference Villamor, D.E.V., Susaimuthu, J., and Eastwell, K.C. 2015. Genomic Analyses of Cherry Rusty Mottle Group and Cherry Twisted Leaf-Associated Viruses Reveal a Possible New Genus Within the Family Betaflexiviridae. Phytopathology. 105:399-408.